Eddy “the Cannibal” Merckx entered the 1975 Tour de France in search of a record setting sixth championship. He had extensive preparation for the Tour including victories in the prestigious classics Milan-San Remo (Ita), Tour of Flanders (Bel), Liege-Bastogne-Liege (Bel), Amstel Gold (Ned). The defending champion seemed well prepared to face a talented list of contenders. Young Italian star Francesco Moser won the prologue time trial In Charleroi (Bel) by two seconds over defending champion Eddy Merckx. Merckx and Moser battled through the first day of racing setting a torrid pace and gaining substantial time on most of the other contenders. Merckx had the fast paced race he wanted. Merckx, the master of the race against the clock, beat Moser by 31 seconds on the 16 km individual time trial (ITT) on stage 6. He earned his first Maillot Jaune (race leader's Yellow Jersey) of 1975. Bernard Thevenet quietly slipped into third place in the overall classification and seemed primed for a great battle with Merckx in the mountains. The Tour entered the famed “Circle of Death” (the hardest day in the Pyrenees Mountains ) on Stage 11. The stage featured the climbs of the Col du Tourmalet and the Col d'Aspin before finishing at the top of the Pla d'Adet. At the bottom of the final 8 km climb to Pla d'Adet, Thevenet attacked and shattered the lead group. Merckx, Zoetemelk, Van Impe and Ocana struggled but answered the move. Dutchman Joop Zoetemelk launched the next attack soon after Thevenet was caught. An inspired Thevenet was the only one to respond and the two rode to the finish line alone. The Dutchman held on to gain a 6 second stage win ahead of Thevenet. Merckx struggled in with Van Impe, 55 seconds behind. Merckx managed to retain the Maillot Jaune, but the Cannibal showed his first sign of weakness in the mountains. The finishing climb on the Puy de Dome (12 km, 7% gradient) was next on the schedule. The legendary giant of the Massif Central has provided the Tour with great drama over the years. This year's battle will write another chapter in Tour history. Just over 4 kilometers up the finishing climb, Thevenet charged off the front with Van Impe in tow. The two slowly pulled away from Merckx and Zoetemelk. The race leader, trying to limit his time loss, was forced to do all the work in pursuit of the breakaway. As Merckx closed the gap near the top of the climb, an angry, drunken fan jumped onto the road and delivered a punch to Merckx's kidney. Merckx staggered in pain and gasped for breath but continued to climb. The punch slowed the effort and he did not catch the breakaway. Gallantly Merckx held on to finish third, 34 seconds behind Thevenet. The Frenchman cut into the overall lead and trailed Merckx by only 58 seconds as the Tour headed into the Alps . After a rest day in Nice, the Tour continued with a 5-climb stage. The third climb of the day, the Col des Champs, Thevenet repeatedly attacked in an effort to crack the race leader. Gamely Merckx was able to cover all of Thevenet's moves and launched an attack of his own on the descent. Thevenet managed to catch Merckx in the valley just before the Col d'Allos. The always-aggressive Merckx, searching for weakness, attacked again on the Allos. Over the top with a lead, he plunges down the descent. On the narrow bumpy road, Merckx took all the risks necessary to gain time. He sailed through the bottom of the descent with over a minute lead on the Thevenet led chasers. The Cannibal now sets his sights on the final climb to the top of Pra Loup. He had a 2-minute lead on the chasers as the road turned upward. Merckx was 6 km from putting the race out of reach. The long breakaway effort had taken its toll and Merckx begins to slow. Gimondi was the first to catch the leader, then Thevenet, then Van Impe and Zoetemelk. The Frenchman sensed a weakness and sprinted by the tired race leader. Thevenet took the stage win by 1'58” over Merckx and gained the race lead. Inspired by the Maillot Jaune, Thevenet attacked on the next stage and rode away from the Merckx group on the classic climb of the Col d'Izoard. He rode alone to win his second stage in a row. Thevenet's win and time gain widen the gap to the now second placed Merckx to 3'20”. There was still one climbing stage remaining in the Alps and Merckx need time gains. Eddy Merckx has one intention at the start of stage 17 in Valloire, get back the Maillot Jaune. Merckx launched an all-out attack from the starting line, 225km from the finish at the top of the Col d'Avoriaz. Misfortune struck early when Merckx slid and crashed heavily. Although injured, he quickly remounted his bicycle and continued the race. His injuries include a bruised hip and knee, as well as a broken jaw, but he continued to ride hard. Although struggling to breathe, he refused treatment. By the end of the stage, the injured Cannibal finished third, 2 second ahead of Thevenet. The “never say die” Belgian was fighting all adversities to the end.  The Tour Ending Finish Line was Moved- Tour organizers recognized the increasing popularity of the “final stage spectacle” and moved the finish line from the Parisian velodrome finish ( Parc des Princes Velodrome 1903-1967, La Cipale Velodrome 1968-1974 ) to the Champs Elysees .  King of the Mountains- the Best Climber Category had been in place since 1933, but it was not until 1975 that organizers awarded a distinctive jersey to the best climber. The first Maillot Pois (Polka Dot Jersey) was sponsored by Poulain Chocolates. The candy company wanted increased public exposure for its products and jumped at the chance to sponsor a Tour jersey. The white jersey with red polka dots was chosen for the sponsor's distinctive candy bar wrapper. Over the years the Polka Dot Jersey has become the second most recognizable jersey in cycling.  Best Young Rider Prize- past awards of the Maillot Blanc (White Jersey) had meant the lead rider in the Combination Classification (best rider in the overall, points and climbing competitions). In 1975 the award of the Maillot Blanc was changed to the Best Young Rider Classification (less than 26 years of age). 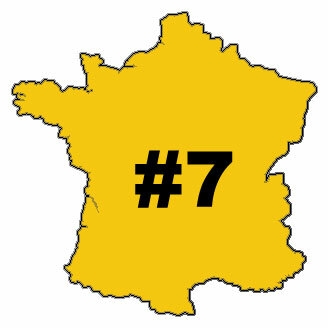 The classification was calculated the same as the Maillot Jaune (race leader's Yellow Jersey), but only available to young riders.